What Lies Below the Ellipse? A Freemasonic connection to all the Megalithic lines of Washington DC cannot be denied. Many of the Presidents involved in various critical stages of the development of the city were high-ranking Freemasons. These include George Washington, Andrew Johnson and Franklin D Roosevelt. There were others but these three men seem to have had the most influence in the development of this system of Megalithic measures. In reality the later stages of the Megalithic adventure in Washington DC is, in itself, an allegorical story of Scottish Rite Freemasonry. In this branch of the Craft there are 33 degrees, or stages of initiation. Many Scottish Rite Masons achieve the 32nd degree but very few get to be genuine, full- status 33 degree Freemasons. Such a thing did not exist at the time of George Washington but both Andrew Johnson and Franklin D Roosevelt achieved this distinction. 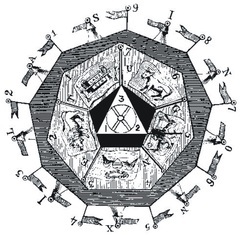 The 32nd degree of Scottish Rite Freemasonry, like all the others, has a symbol, which in the case of the 32nd degree is a pentagon, as shown in the picture on the left. It can be seen that within the 32 degree pentagon is a triangle, and this triangle is the sacred symbol of the 33rd degree of Scottish Rite Freemasonry. Now look again at the picture below. This triangle could not have come into existence, with its 33 X 366 Megalithic Yards (or 33 Megalithic seconds of arc of the Earth's polar circumference) until the Pentagon was created during the 1940's, on the express orders of 33rd degree Mason President Franklin D Roosevelt. In other words, the 33 degree status of Washington DC and therefore the United States, could not be conferred until the Pentagon of the 32nd degree was created. This of course brought the 33rd degree triangle into existence. If this sounds a little far-fetched, you need to know what the 32nd and 33rd degrees are actually about. Every degree of Scottish Rite Freemasonry has its associated stories and rituals. In the case of the 32nd degree this deals with a young knight by the name of 'Constans'. Constans, in the allegory, is left alone all night in silent meditation at the alter of a chapel in a pentagon shaped army camp. He is told that he must not leave this place under any circumstances. In the ritual, the figure of Constans is tempted by a series of different characters, all of whom try to persuade him to leave his vigil and go off to do something else. Constans refuses all the temptations. Finally, he hears that his camp has been attacked and that men are being killed and women are being violated. Despite his holy pledge Constans can no longer stay in silent meditation but dashes out to join in the battle. When his companions return and find that he has gone, Constans is, at first, accused of being a coward and a man who breaks his word, because he promised to stay in the camp. But then a body is brought in on a bier and it is seen to be that of Constans, who, it is suggested, fought more bravely for his fellow men and women than any other soldier. He is therefore declared to be a hero and the best sort of Freemason. Many people in the United States wanted nothing to do with the wars that were ravaging Europe at the start of the 1940's and adopted an isolationist policy, a little like Constans at the alter of his chapel. But President Roosevelt and many like him could see that if the world was going to remain free and democratic, the United States, with its vast resources and its idealization of freedom would sooner or later have to join in. Of course when Pearl Harbor was bombed, in December of 1941, the United States had no choice but to declare war on Japan, but we need to bear in mind that the Pentagon, home to the United States military effort, was started before this date. The Pentagon was commenced in September of 1941, two full months before Pearl Harbor. There was no doubt about it, the President knew for sure that sooner or later the United States could stay no longer at the alter of the chapel but would have to go out into the world and fight. Earlier in his Presidency, President Roosevelt had promised that nobody's sons would have to die in some foreign war. This was a promise he had to break, but by building the Pentagon and completing the triangle across Washington DC, President Roosevelt was acting out the 32nd degree ritual on behalf of the whole of the United States. Every American citizen 'became' Constans and became worthy of the 32nd and ultimately the 33rd degree of Scottish Rite Freemasonry. And now bear this in mind. President Franklin D Roosevelt was the 32nd President of the United States!!! Niether this website or any of our books are appologies for Freemasonry. People must make up their own minds. Generally speaking we 'report' and we avoid making inflamatory comments. However, those who accuse Washington DC of being a haven for 'satanic' Freemasons, whose dubious objective is to build some terrible, oppressive world in which freedoms are extinguished, might do well to merely consider the story of the 32nd degree, the mythical figure of Constans and the actions of the United States of America at the start of the 1940's. Meanwhile, those people, in particular some Christians, who claim all Freemasons to be devil-worshippers might also consider these matters. In light of the assistance the United States gave, initially to Britain and then to the world directly during the whole of WWII, would it not be appropriate to quote something that Christians themselves are told to bear in mind? And how much more virtuous still when he lays down his life for people he doesn't even know and for the cause of freedom?